Dog Gone Smart Nano Dog Coat Aspen is a comfortable dog jacket treated with nano technology to repel water and unpleasant smells. The belly strap helps keep the coat in place. Ideal for use in cold or wet weather. 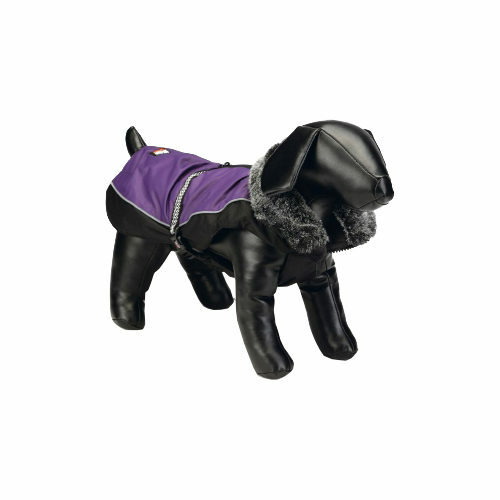 Dog Gone Smart Nano Dog Coat Aspen is a comfortable doggy jacket with a belly strap that helps keep the coat in place. The textile of these coats is treated with nano technology, making it water, dirt and oil repellent. An ideal jacket to use when out for a walk in the cold or wet weather. The dog's scent is often caused by the oil in its coat. This oil penetrates the textile of dog clothes or beds, for example, and attracts bacteria. These bacteria cause the unpleasant dog odour. The nano dog coats from Dog Gone Smart are made of textile that is treated with the so-called "Repelz-it" nano technology. This has an oil-repellent effect, countering the unpleasant dog odour. This method of treating textiles is pet and environmentally friendly. What if the Dog Gone Smart Nano Dog Coat doesn't fit? The dog coat can be removed from the packaging and held up next to your pet in order to check whether it fits. For hygiene reasons, the jacket cannot be returned if it has come into contact with your pet. If we find that the returned product is stained, worn, contains hair, smells or has been washed after use, we cannot return the product to you. In this event, it will be donated to a charity (local shelter). As we are often confronted with products that are returned in a less than new condition, we have to apply these rules for fitting and/or returning products. Have you used Dog Gone Smart Nano Dog Coat Aspen before? Let us know what you think about this product.